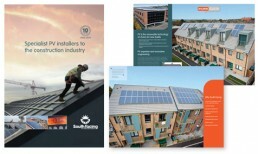 South Facing commissioned me to create marketing materials ready for their campaign – targeting the use of PV into the construction industry. Their 12pp brochure/folder included stunning aerial photography of their recent projects. The brochure/folder included pockets within the front and back cover to contain case studies and quotation documents.